These coffee station vignette ideas can help you style a lovely, seasonal coffee serving space that is beautiful~not boring. Update: This is an updated post from Fall of last year. 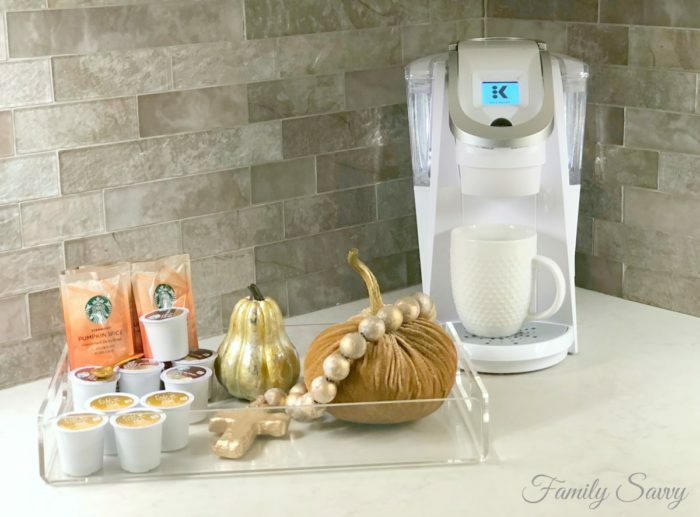 Since Fall is just around the bend, many of us will start serving guests seasonal beverages from a coffee pot or Keurig. With just a little imagination, you can turn a boring coffee corner into a lovely, inviting space. 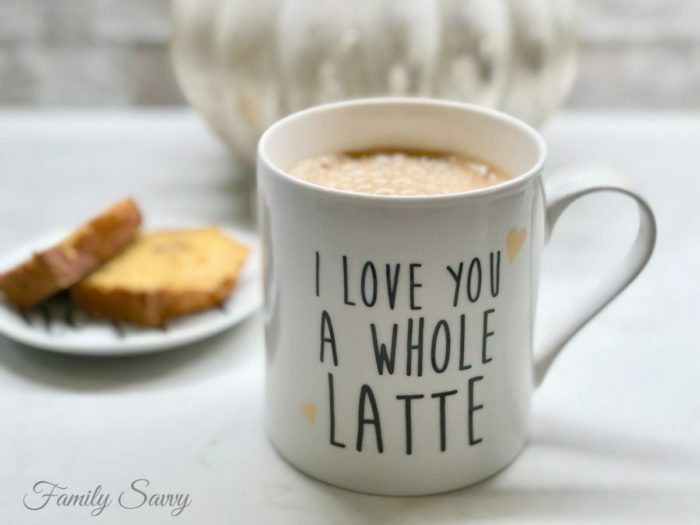 These coffee station vignette ideas are a few ways I’ve styled my coffee station in years past. But first, coffee. I link to my favorite coffee pot (5 years and going strong) and Keurig (which we moved downstairs for house guests). I love using white, and I just saw that my Cuisinart coffee maker has been updated to include a stainless steel with white trim. That will be my next one when the time comes. 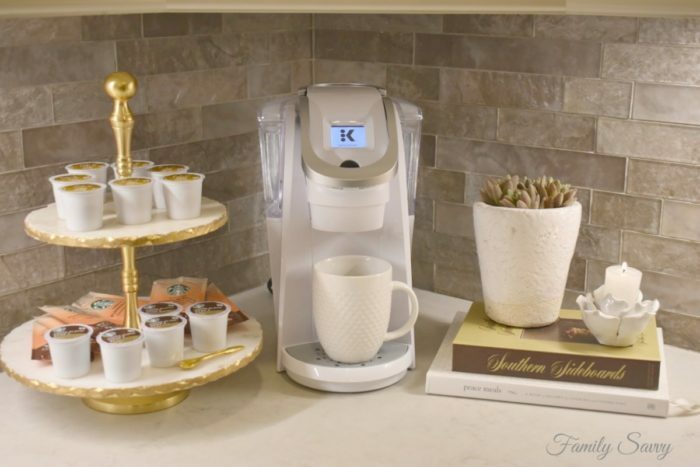 So whether you serve guests with a coffee pot and assorted flavors or with a Keurig with assorted pods, there are myriad ways to style a coffee station. For Fall, I love using pumpkins. If you want to see how I make my own white velvet pumpkins, read this post. 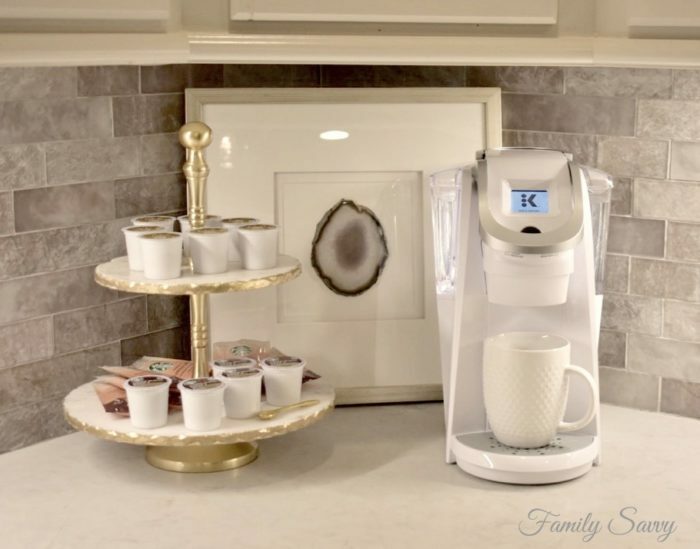 The photo above is a fave way to style a Keurig coffee station for a dinner party. The marble tiered server with gold adds a bit of glam while being a perfect place to display the assorted coffee pods. Cookbooks are great ways to add interest and vary height. I love succulents, and a candle of any size is a must. Varying sizes and heights of a display is the way to go. Above, I remove the books, plant & candle and use the tiered stand with a framed Geode behind. Any framed item that fits your space will work, and it is a wonderful way to hide cords and outlets. My geode is custom framed, which is easy to do at your nearest frame shop if you find geodes that you like. In the above photo, I go super simple and bring out my much used acrylic coffee table tray. This tray is FAB; I use it all the time when serving guests. In this vignette, I just put all the coffee pods and packets and then throw in a few pumpkins and some blessing beads. Fresh flowers would be great also. You can style your coffee station with any vignette, just think odd numbers and varying sizes and shapes. Below are links to some very versatile items that can be integrated into a coffee station or table top vignette. I hope these ideas have inspired you as (hopefully) cooler weather nears and warm beverages will be center stage. I’d love to hear how YOU style your coffee space (and please send pics)! As always, thanks so much for stopping by. Be blessed, and stay (coffee vignette) savvy!! !